This pie has a shortcrust pastry crust and a very rich, tasty filling of creamy caramel and walnuts. The creaminess of the caramel depends on whether heavy whipping cream is used, or whole milk, or something in-between. The Engadin valley of the Swiss kanton Graubünden in the southeastern Swiss alps, is famous for this type of pie - even though walnut trees are not native to this highland valley. Actually, the pie itself does not even originate here! Supposedly, confectioners from the Engadin region brought the recipe home from their travels in the walnut-rich parts of southwestern France, such as the Périgord. This was back in the late 1700s, early 1800s. Basically all the Swiss added, was a dough cover to make the pie keep longer. These days, practically all walnuts used in the Swiss pies come from the US state of California. And these pies are not exactly cheap (is anything in Switzerland?) 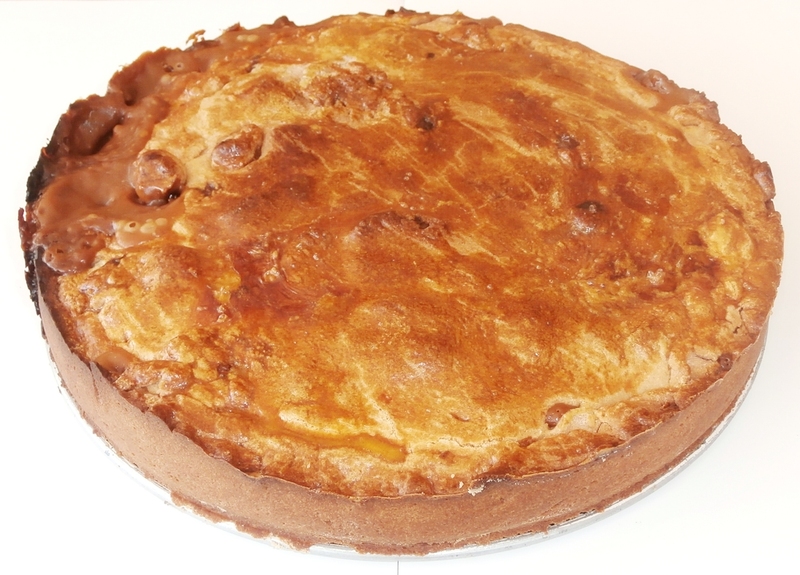 - about 20 Euros (22 USD) for a 500 gram (1+ pound) pie (2015 pricing)! Make at least 1 day ahead! ©2006-2018 F. Dörenberg, unless stated otherwise. All rights reserved worldwide. No part of this publication may be used without permission from the author. I usually heat the glas jar in the microwave oven (obviously without the metal lid!) for 10-15 sec. This makes it much easier to pour out the honey, or to empty the jar. Put the flour, sugar and salt in a large bowl and whisk (to loosen up the flour and to blend the ingredients). Add two tablespoons of cold water or cold milk to the flour mix. Lightly beat 1 egg, add to the flour mix, and blend in with a large fork. Cut the cold butter into the the flour mix . If you don't want to get your (washed) hands messy, use a kitchen machine. Form dough into ball, wrap in plastic kitchen film, and chill in refrigerator for 1 hour. Melt the sugar, honey, and margarine in the sauce pan on low heat. Stir regularly until until a homogenous mass is obtained. Add the nuts and the cream, and stir in. Slow boil for 30-35 minutes, Stir very regularly - do not walk away! If needed, use a heat diffuser between the burner and the pan. Carefull: do not splash while stirring, as the mass is very hot! After about 30 minutes, the mass will start to thicken and the color turns to light beige (from caramelizing). Continue for a couple of minutes. Take pan off the heat, and let cool 5 minutes. Turn the oven on, set the thermostat to 185 °C (365 °F). Grease the springform pan with some butter. Take dough out of the refrigerator, cut into two parts (about 60/40 - use a scale! ), and reform into two balls. Roll the larger dough ball into a round sheet that is about 5 cm (2") larger than the diameter of the pan. Transfer the dough sheet to the pan, and cover the bottom and insides. Scoop the warm walnut filling into the pan, and spread out evenly (with a spoon or spatula). Roll out the smaller dough part into a round sheet, the same diameter as the pan. Cover the pie with this dough sheet, close the seams around the edge, and lightly push the dough onto the filling. Transferring ther dough is easiest by rolling the dough onto the rolling pin, and unroll the dough on top of the filling. Beat the egg yolk and lightly brush the top of the pie with it. With a fork, prick some vent holes in the top of the pie. Optional: drag the back of the teeth of the fork across the top of the pie, to make a pretty pattern. Bake for 40 minutes (fan on) in the center of the oven, until golden. Note: the caramelized filling may boil over the edges - this is OK. The filling is very sweet and very rich! Do not serve regular-size slices. I usually cut the pie into pieces of about 2-3 cm ( ≈1 inch) square, like you would for brownies. If you want to be fancy, serve individually in small fluted paper wrappers (baking cups, candy cups).